Natural Import Company - Traditional Japanese foods - Mitoku Sea Vegetable Crackers - 2.1 oz. Mitoku Sea Vegetable Crackers - 2.1 oz. Ingredients: brown rice, kombu, wakame seaweed, tamari (whole soybeans, water, sea salt), brown rice malt. 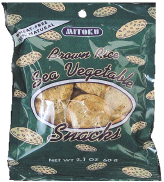 Mitoku Sea Vegetable Crackers are made of steamed brown rice and wholesome sea vegetables. These crackers are unique and delicious wheat-free snacks oven baked to perfection, then seasoned with the finest natural tamari (soy sauce) and authentic brown rice malt. They contain no leavening, no preservatives, and no wheat flour of any kind. Enjoy the superb flavor and satisfying crispness right out of the bag, or try them when eating soup or with your favorite dip. Rutherfordton, North Carolina 28139 U.S.A.